Ever wondered where’s the best place in the world to swim with dolphins or the best place to snorkel with turtles? Our oceans are filled with colour and teeming with life and beauty. And a simple mask and fins can give you a window into that world. Equal parts exhilarating and relaxing – it’s a different experience to diving, but just because you’re not plummeting to the depths doesn’t mean that the sights you’ll see will be any less incredible. Read on for some of the best snorkelling destinations around the globe and why you should consider them for your next trip. Where’s the best place to snorkel with turtles? Watching these peaceful creatures glide gracefully through the water, stopping to munch a while on sea grass is a magical experience not to be missed. It’s like heading back to a pre-historic time. But where is the best place to swim with sea turtles? Great for beginners thanks to a rock wall that keeps the swell down, you barely need to enter the water to see the green sea turtles frolicking. And there’s even a chance of seeing a critically endangered hawksbill. In general, it’s said that Hawaiian turtles are some of the friendliest in the world. Closer to home, head for the Greek conservation area of Kalamaki Beach. Snorkel with loggerhead turtles and between May and October you might even be able to see them come ashore to rest and nest. Get lucky and you’ll spot the tiny babies heading back to sea. This is one of the best places to see sea turtles hatch in the Mediterranean. For regular sightings of hawksbill and leatherback turtles head to Carlisle Bay, near Bridgetown in beautiful Barbados. The Barbados Sea Turtle Project is working hard to protect the island’s turtles by banning hunting activities. As a bonus there are numerous shipwrecks in the area – keep an eye out while you’re turtle spotting and you never know what you’ll find. Egypt’s Red Sea is known for clear, colourful coral and abundant sea life. But did you know it’s also famed for its many resident dolphin pods? Head to Marsa Alam for your snorkelling holiday and you’ll find one of the best places in the world to snorkel if dolphins are your thing. Explore the edge of the Samadai and Sataya reefs for opportunities to get up close with up to eight species of dolphins, most notably spinners and bottlenoses. Socorro Island, some 370 miles off the western coast of Mexico, is commonly known as one of the best places in the world to swim with dolphins. It’s one of the world’s best dive destinations thanks to regular sightings of manta rays, whale sharks and humpback whales, but you can enjoy some pretty good snorkelling here too, with almost guaranteed sightings of bottlenose dolphins. The east coast of South Island is one of the best places to meet the southern hemisphere’s Dusky dolphins. Found in pods of between 100 and 1000 in the area, you’ll be able to swim and snorkel with them to your heart’s content. Sharks are an acquired taste – for some they hold a morbid fascination, while for others the idea of sharing the water is too much to contemplate. Thankfully there are plenty of species that hold no threat to us humans, and these are some of the best snorkelling sites in the world to find them. With water only around eight feet deep and easily accessible reefs, this area is known as Shark Ray Alley thanks to the crystal clear, teeming waters. Wait for the dive boats to come in and the nurse sharks will descend in expectation of a feed. Just south of Koh Tao you’ll find one of the top snorkelling spots in Thailand for swimming with sharks. Here you’ll be able to swim among black tipped reef sharks of up to six feet. Although stay in the shallows and they’ll be a more palatable size. Some of the coral in this area is badly damaged, but it serves to illustrate the difficulties our oceans are facing. The area is world famous for its dive sightings of whale sharks, although you’d have to be extremely lucky to see one while snorkelling. For sheer variety and abundance of undersea wildlife, the Maldives is renowned for some of the best snorkelling in the world. If you choose your resort carefully, you can see reef sharks, dolphins, rays, hawksbill sea turtles, morays, multi-coloured reef fishes and squids not to mention stunning coral. 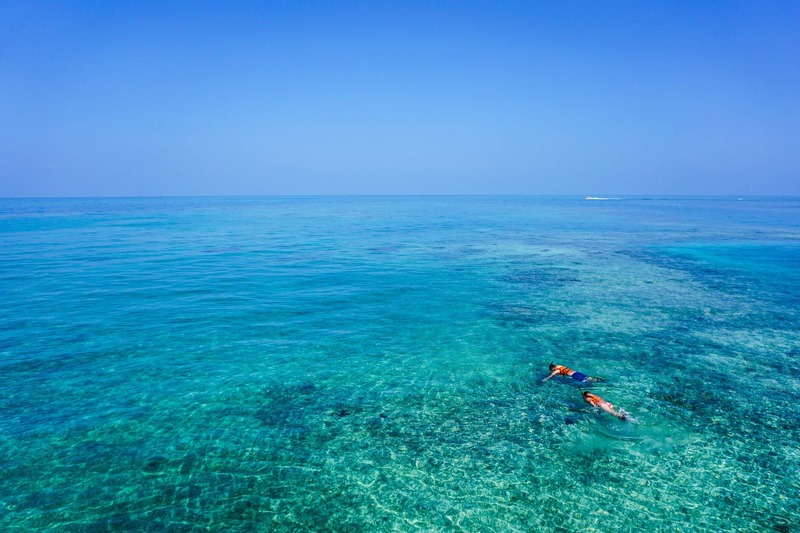 For top snorkelling spots direct from your door make sure you choose a resort with a house reef close by. Other resorts situated in lagoons will offer paid excursions. Islands in the Ari Atoll are considered some of the top snorkelling destinations. As we enjoy the oceans, we have a responsibility to work to protect them and their inhabitants for future generations. It’s thought the greatest threat to our oceans globally is plastic pollution, specifically microplastics. Nowhere is safe. A November 2018 study based at Faafu Atoll in the Maldives discovered an abundance of microplastics affecting, in particular, the inner reef. It’s not just the problems of ingesting plastic particles and its long-term impact on sea life and the food chain. It’s the ability of those plastics to transport microbes and contaminants throughout the oceans, damaging fragile species such as coral and destroying the homes of our precious sea creatures. Every year about eight million tons of plastic waste ends up in our oceans, where it is broken down into these tiny particles. East Asia is one of the worst affected places with a 2016 reported figure of 27 times as much plastic in the ocean around Japan than anywhere else in the world. And then there’s the Great Pacific Garbage Patch – a swirling mass of predominantly plastic debris that’s estimated to weigh 80,000 tons. In fact, research by the World Economic Forum and Ellen MacArthur Foundation estimates that by 2050 there could be more plastic than fish in the sea. There are a few simple changes we must make sooner rather than later. Avoid using cosmetics and other products that contain microbeads that can’t be filtered out of wastewater, cut down on plastic bags, and single use plastics where possible and dispose of all plastics in a suitable way, preferably by recycling. And when you’re visiting some of the best snorkelling destinations in the world, why not get involved in the Big Microplastic Survey? It’s a global citizen project designed to helping researchers to understand the extent of the problem of microplastics and work to preserve the oceans, including these top snorkelling spots, for future generations of both our own species and these incredible sea creatures with whom we share our planet.